The Everton and Ireland midfielder signed a new contract this afternoon. Everton's James McCarthy signed a new contract today. EX-IRELAND INTERNATIONAL Kenny Cunningham has backed Aston Villa’s Ciaran Clark to shine this season, while the he also believes that the Premier League’s big four “missed the boat” on James McCarthy. The pundit was an accomplished defender during his time as a player, earning 72 caps for Ireland in the process. And Cunningham feels Aston Villa player Clark has yet to fulfil his potential at international level. “I’d be disappointed and I am disappointed that he isn’t already [a key Ireland player] at 25 years of age. “I saw him a number of years ago [for the first time] and have been a big fan of his. And while acknowledging the player’s talent, Cunningham feels there is still much room for improvement in Clark’s game. “As a young defender, there are certain aspects you can only learn through experience — in particular, decision-making. When you have the kind of tenacious streak he has, it can be difficult taking a step back away from the ball rather than towards the ball. “He has been found out a little bit — as defenders all are at that stage — in terms of being too close to a striker and maybe getting done by a bit of clever movement. The Setanta analyst also feels the presence of Clark in the Irish team would give manager Martin O’Neill greater scope to experiment. “If he was to come into the team at centre-half, it frees up a couple of options. Marc Wilson, in particular, is a player we can utilise in a number of areas. Some people talk about maybe having a problem at left-back — that’s resolved if Marc plays there. As a holding midfielder, he’s very comfortable. That’s somewhere else where we can use him. Wilson has forged a decent partnership with John O’Shea, but he’s a player whose versatility we could utilise. Cunningham also played down the significance of the number of Irish players currently plying their trade in the Championship. Another Irish player that will attract particular interest this year is Robbie Brady, after his big-money move to Norwich in the summer. And Cunningham feels the player is best suited as far forward as possible, rather than the left-back slot he has occupied for Ireland of late. “Robbie Brady is one for the future. It’s about getting the best out of him. And how do you get the best out of him? Is it as an orthodox left-back? Is it in a wing-back position that we’ve seen him play for Hull? “Does that mean we have to change the shape of the team to accommodate him and maybe Seamus Coleman? They play so strongly in those positions that there’s an argument for it going forward. 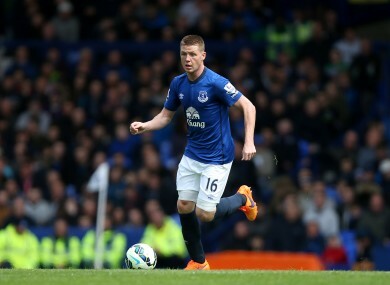 And as for James McCarthy, whose new contract with Everton has just been announced? “I think James is good enough to play for one of the top four clubs and I think they missed the boat when Everton snapped him up a couple of years ago. “But I don’t think it’s a problem for him playing at Everton with a manager like Martinez. He’s playing in a good environment at a good level. Presenter Conor Morris and pundits Kenny Cunningham, John Hartson and Matt Holland were at the Setanta Sports studios in Dublin today to mark the return of Premier League Central for the 2015/2016 Premier League season. Premier League Central, the first place to see Premier League highlights, is back on the air this Saturday, August 8th at 8.30pm. Email “'Premier League top four missed the boat on James McCarthy'”. Feedback on “'Premier League top four missed the boat on James McCarthy'”.